The X-Files Collectible Card Game (XF:CCG or X-Files CCG) is an out-of-print collectible card game based on the X-Files fictional universe. It was created by the US Playing Card Company (USPCC). The Premier Set was first released in 1996 and debuted at Gen Con. Initially, 80 million cards were shipped on November 1st, 1996. Over the next year, USPCC would create the first expansion, 101361, a 2nd edition set known as The Truth Is Out There, and a number of promotional cards. The second expansion, 22364 was apparently finished, and ready to be produced, when the game was terminated in 1997. Three collector sets were also cancelled. Premier (1996) – This was the first set for the X-Files CCG, sold in both 60 card starter decks and 15 card booster packs. The set contained 354 distinct cards. Card images and concepts were taken from the first two seasons of the X-Files. 101361 (1997) – This 125-card set, named after Fox Mulder's birthday, contained images and concepts from the third season of the X-Files. The set included five ultra-rare cards, and was notable for including no Combat or X-File cards. 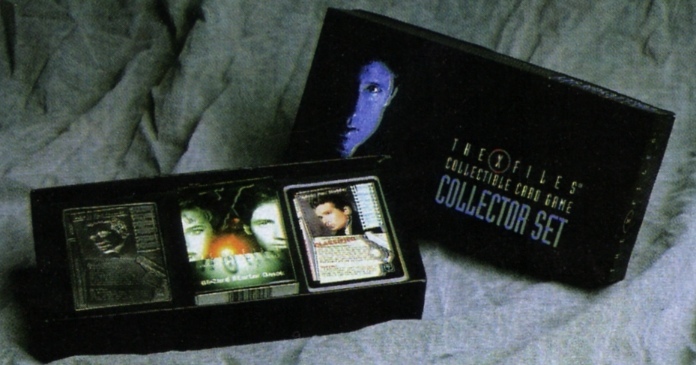 The Truth Is Out There (1997) – This 354-card set, named after the tagline from the show, is the second edition of the core set. Thirty cards were removed from the Premier list, including all ultra-rares and some problematic rares, and replaced with a new set of rare and ultra-rare cards. The Gen Con Deck (1996) – At Gen Con '96, these decks were used to demo the game to potential players. After the demonstrations were done, these decks were supposed to be destroyed, but it is apparent that a number of them were not. There are two versions of the deck, one that was banded together, and the other that came in a white box labelled "Top Secret/Classified". There are a number of unique features that make both versions of the deck highly sought after. Pewter Agents Mulder and Scully (1997?) – Little information is known about these cards. According to one source, these cards were intended to be sold as a special promotion or collector set, and orders were already being taken, when the game was canceled. A prototype card apparently appeared on eBay somewhere between December 2004 and January 2005, and one viewer mentioned "the asking price had too many zeros". ^ Miller, John Jackson (2003), Scrye Collectible Card Game Checklist & Price Guide, Second Edition, pp. 651–655. ^ "The X-Files CCG: Premiere Edition". This page was last edited on 4 March 2019, at 09:31 (UTC).